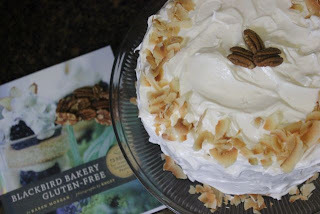 Hummingbird cake... have you heard of it? It's not a cake I was very familiar with before finding it in a gluten-free cookbook. Apparently, it's one of the "national cakes" of Jamaica... I wonder what the US "national cake" would be... 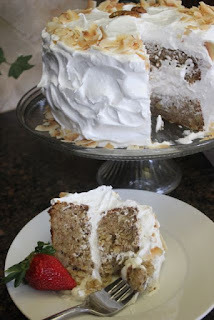 This cake is truly luscious - it's rich, super moist, and has amazing flavors. I've only made the gluten-free version of this cake and I don't think I'll change anything about the recipe next time I make it. 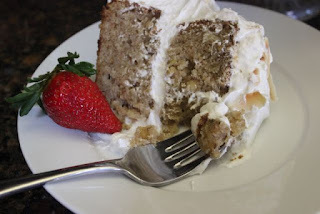 I'm finding that sometimes, I like the gluten-free versions better --- for example, I always make my banana bread gluten-free (and in the form of muffins). 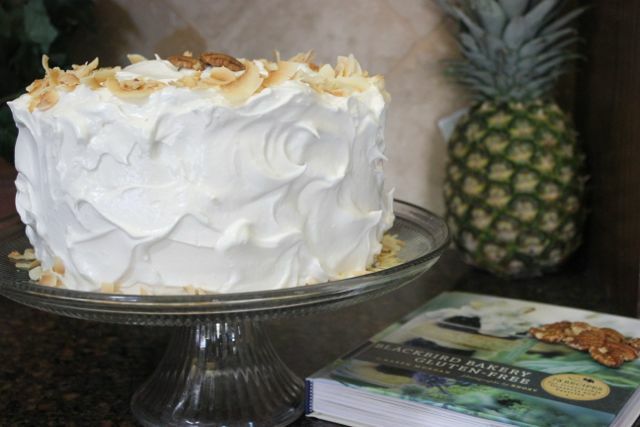 Speaking of bananas, this hummingbird cake has banana and pineapple. It's fantastic. Preheat your oven to 350 degrees. Butter two 8-inch cake pans. Line the bottom of each pan with a piece of parchment paper (here's the link with some helpful hints) and butter the parchment paper. In a large bowl, combine the cornstarch, all of the flours, almond meal, baking powder, xanthan gum, salt, sugar, cinnamon, and nutmeg. Whisk to blend. Mash the bananas in a large bowl and add the pineapple, agave nectar, and vanilla. Stir until smooth. Add the oil and eggs to the dry ingredients and blend until smooth. Add the chopped pecans and the banana-pineapple mixture and stir until blended. Divide the batter between the two prepared cake pans. Cover each pan with aluminum foil and bake for 50 minutes. Uncover and bake for another 10 minutes. Remove the cakes from the oven and allow to cool in the pans. In a small saucepan, combine the sugar and water. Bring to a boil over medium-high heat, whisking to dissolve the sugar. Cook the mixture until it reaches 239 degrees on a candy thermometer. While the sugar and water are heating, beat the eggs whites in a stand mixer fitter with the whisk attachment until opaque. Add the cream of tartar and continue to beat on high until thick and foamy. Add the vanilla and beat. When the sugar reaches 239 degrees, immediately pour the hot sugar mixture into the eggs whites in a slow steady stream while the mixer is running. 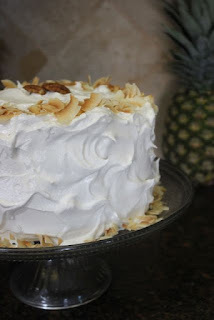 Continue beating the icing until stiff, glossy peaks form (about 5 to 7 minutes). Place one of the cakes on a large plate. Top with about 1/3 of the frosting. Top with the second cake and frost the top and sides of the stacked cakes. Garnish with some whole pecans or toasted coconut if desired. recipe slightly adapted from Blackbird Bakery Gluten-Free cookbook.